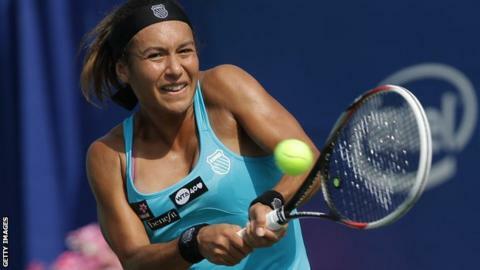 British number three Heather Watson has appointed Argentine Diego Veronelli as her new coach ahead of the 2014 season. Watson split with Colombian Mauricio Hadad in July and worked with Jeremy Bates for the US hard court stretch. But she has not had a coach since the end of a 2013 campaign that was hampered by glandular fever. The 21-year-old was introduced to Veronelli by his compatriot Dante Bottini, who she knows well from her time at the Bollettieri Academy. Bottini is currently coaching men's world number 16 Kei Nishikori. Veronelli, 34, is based in Florida but has been working with Watson in London for the past week-and-a-half. He has previously coached Joao Souza of Brazil and Argentina's Paula Ormaechea. The pair will travel to Australia on 30 December, where Watson hopes to play in Brisbane, Sydney and at the Australian Open. Having slipped to 121st in the world rankings, Watson is likely to have to come through qualifying to contest the main draw of all three tournaments. Watson and Veronelli will review their partnership after the Australian hard court season. "Glandular fever was an obstacle but it's gone," Watson told BBC Sport. "It was a setback but I'm looking forward to starting afresh in 2014." Heather Watson was speaking at a coaching clinic for tennis charity Give It Your Max in conjunction with Statoil's Heroes of Tomorrow initiative.